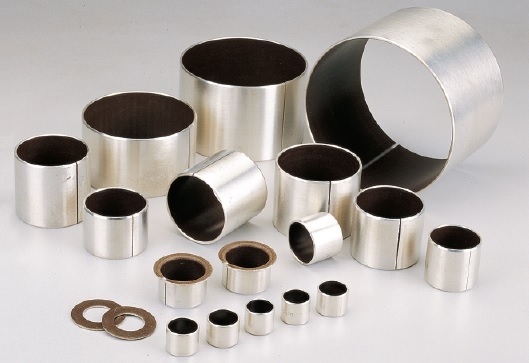 CSB-50 - CSB Sliding Bearings India Pvt. Ltd.
reduced swelling. Also performs well with lubrication. 1. PTFE/Fibre mixture thickness 0.01~0.03 mm, provides an excellent initial transfer film, which effectively coats the mating surfaces of the bearing assembly, forming an oxide type solid lubricant film. provides Max. 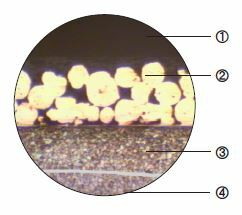 thermal conductivity away from the bearing surface, also serves as a reservoir for the PTFE-Fibre mixture. 3. Low-carbon steel, gives exceptionally high load carrying capacity, excellent heat dissipation. This material meets the demanding criteria for long life and trouble-free performance with or without lubrication. Automotive: tractors, combines, crop sprayers, earthmover, graders and other construction, auto machines, specific uses in power steering cylinders, steering gear thrust washers, disc brakes, callipers and pistons, shock absorbers, governor linkage, wind shield wiper motor, tilt gear assemblies. Business Machines: photocopy machines, typewriters, mail sorters, postage meter systems, computer terminal printers and peripheral equipment, automatic printing devices, mail processing machinery. Hydraulics and Valves: pumps including gear, rotary, water, axial piston, and other types, ball, butterfly, poppet steam, and other valves and valve trunnions. Home Appliances: tape recorders, refrigerators, air conditioners, cleaners, polishers, sewing machines, ovens, dishwashers, clothes washing machines. Materials Handling: Marine engine, packaging, textile equipment, tools.